Caesarâs Real Estate World XI joined Bruce Law Chambers Sparta to take honours in the 2017/2018 National Lotteries Authority/FLOW/Hairoun North East Football League. When the league closed off its operations on Sunday at the Chili Playing Field in Georgetown, World XI pouched the First Division honours. World XI, though, needed the penalty kicks route to beat North Windward All Stars in the final. The encounter, which was started in the afternoon into the evening, was locked 2-2 in regulation time and during the added 10 minutes extra time, the scores remained untroubled. 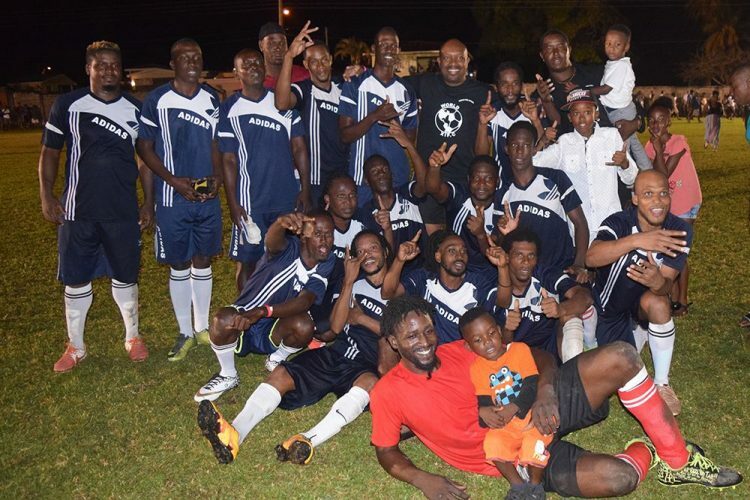 Dorian Dallaway and Curlon Joseph scored for World XI, while Ozim Henderson and Rayshawn were the respective equalizers for North Windward All Stars. World XI were more accurate in the kicks, scoring 4 to North Windward All Starsâ 3. For winning the title, World XI gained $1,500, while runners-up North Windward All Stars gained $1,000. In a similar vein, Sparta registered a 5-3 win on kicks from the penalty spot against a plucky Greiggs outfit, to win the Community Shield title and $500. Both units had played to a 0-0 tie in regulation time, and extra time did not alter the scoreline. The Community Shield featured 16 teams from the league; however, participation was restricted geographically. Hence, only teams which originated from Fancy in the north, Richland Park in the west and south as far as Biabou, were eligible to participate. Prior to Sunday, Sparta were installed as the new champions of the Premier Division. Played on a round robin format, Sparta ended on 19 points, gained from five wins, one draw, as well as one defeat, with a bonus three points gained from participating in the march past. Second were 2016/2017 winners PYOLA, who saw their reign ending on 15 points. PYOLA edged out Je Belle Chapmans on goal difference, as both were locked on the same number of points. Je Belle, the 2016/2017 losing finalists, placed fourth on 14 points. Sparta carted off the healthy winnings of $3,500; PYOLA got $2,500, Je Belle Chapmans â $700 and Je Belle â $500.